Wearables represent a myriad of opportunities, but ongoing challenges with developing and marketing these devices remain a hurdle for the industry. 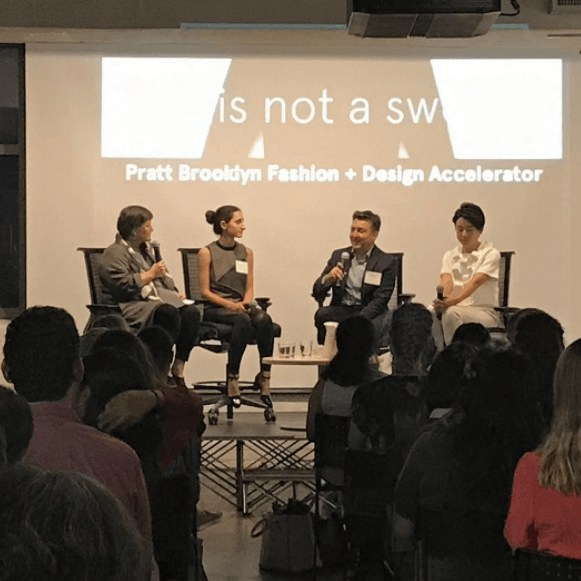 On Tuesday, the Brooklyn Fashion + Design Accelerator hosted “This is Not a Sweater: Smart Garments & Functional Fabrics,” a panel discussion on the challenges associated with wearables and how the industry could combat issues in this emerging space. The topic sits at the heart of the BF+DA’s mission, which is to equip designers with the resources they need to create advanced apparel that caters to consumers’ everyday needs—something the sector has to master in order to grow. And with a new $500,000 grand from Brooklyn Borough Hall, the accelerator can amass more equipment like digital loom and technical embroidery machines with which to equip its designers. The biggest issue in creating these pieces is merging fashion and technology together, which can be daunting. Wearables have to be stylish, and they have to work. Zhang’s company is making wearables less stressful to develop with its e-textile technologies system, including circuit design, muslin prototype & pattern design, in addition to product method research & testing, so companies can ensure that their smart garments work properly and adhere to universal fashion design standards. Olivia Burca, Wearable X garment engineer, said since wearables is an emerging field, it can be difficult to pinpoint issues in advance given that brands often don’t have a lot of data on their products to serve as a benchmark. Burca said, her company’s Nadi X, a pair of smart leggings that vibrates and guides wearers into the right yoga poses, is constantly undergoing testing to make sure it’s suitable enough for consumers’ workouts. Chris Kasabach, Watson Foundation executive director, weighed in on the consumer aspect. He said it can be difficult to persuade the average consumer to buy wearables, since most are unwilling to wear smart garments if they don’t look like traditional clothing or provide relevant capabilities. When it comes to wearables, consumers desire smart garments that don’t only feel and look like common clothing, but go beyond the standard wrist tracker that alerts them about their health or physical activity. Spreading the word about the benefits of these smart garments is also a concern. Because the sector is so new, going the typical influencer route may not be the right fit.